Castle Dore is an Iron Age Hillfort in Cornwall, England. This is a small, multivallate, partial contour hillfort, located on prominent ridge overlooking at least two tributaries of River Fowey. Two oval structures, possibly Romano-British or later occupation, but pottery suggests abandonment before Roman period. Finds included South-Western Decorated pottery and cordoned wares, late Iron Age bead, amphorae, Iron Age imported glass bracelets and a glass bead. Finds relating to skirmish between Charles I and Earl of Essex 1644 when Parliamentarian forces retreated into earthworks and held position until dark. Summary: Small, multivallate, partial contour hillfort, located on prominent ridge overlooking at least two tributaries of River Fowey. Steep surrounding slopes to E and W, ridge to N and S moderate. Circular interior area enclosing 0.5ha. 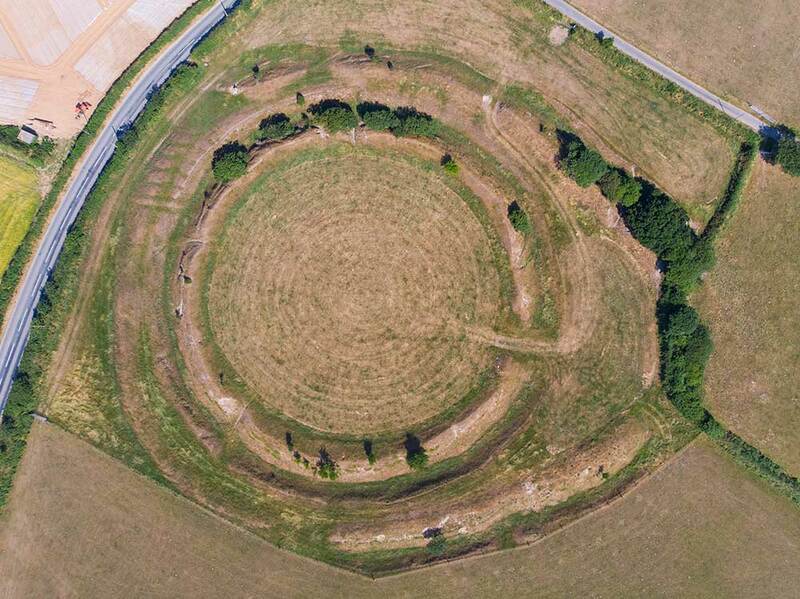 Defined by good inner rampart and ditch with further, mainly concentric, outer rampart and part-buried outer ditch, diverging from inner rampart only on E to form more complex entrance annex. Mapped as three banks in 1847, no trace of third now. Glacis construction of ramparts. Interior partially excavated 1936 and 1937 by C.A. Raleigh-Radford. More recent reinterpretation of results suggests site constructed 5th-4th centuries BC based on ceramics. Later phase followed period of abandonment when entrance remodelled c. 4th-3rd centuries BC. Interior with four-to six-post structures (c. 20) and roundhouse remains, defined by post- holes with complex building sequence and frequent replacements of structures over long time. Two oval structures,possibly Romano-British or later occupation, but pottery assemblage suggests abandonment before Roman period. Finds included South-Western Decorated pottery and cordoned wares, late Iron Age bead, amphorae, Iron Age imported glass bracelets and a glass bead. Finds relating to skirmish between Charles I and Earl of Essex 1644 when Parliamentarian forces retreated into earthworks and held position until dark. Site in Arthurian legend. Plough damage to interior, trees and scrub on banks. On 1st Ed. OS map (1881-82).